Notre Dame of Mount Carmel in Cedar Knolls, New Jersey has over 2,000 church members signed up on Flocknote, as well as many ministries who use it on a regular basis. Cristina said Flocknote is a lifeline for their ministries — such as Extraordinary Ministers of Holy Communion (EMHCs). With five church services a weekend and eight EMHCs needed at each one, this ministry requires a lot of planning and communication. In the past, they had to publish a roster and volunteers had to find a substitute by going down the roster and calling each name to see if they could substitute for them. This cumbersome process discouraged a lot of people from volunteering. The volunteer Lectors now do the same thing, and Cristina said it is nice that all the notes are there in Flocknote within the group, so members don’t have to unnecessarily search through old emails. Flocknote has also been a great evangelization tool for their church. For example, Cristina teaches a confirmation class for their high schoolers. After each class, she sends their parents a Flocknote letting them know what they discussed that day. If they watched a video, she is able to incorporate it into the note using the embedded video feature. “This is just another way to give them a window of opportunity with their kids and what might be going on within their hearts,” said Cristina. Another ministry that uses Flocknote creatively is the Kitchen Angels, who make meals each month for the Senior Luncheon in the Church Hall. Each month they have a specific menu that they send out via Flocknote, which makes it easy for the volunteers to click on the link and sign up for what they are bringing. These are just a few examples of the ways NDMC uses Flocknote to further the mission of their church. Easy, fast and effective communication with their members is a crucial part of helping them and their ministries continue to grow and spread the Gospel. Your Dashboard & Unolytics are two of the most powerful tools at your disposal when communicating with your flock. Watch the video below to see what you can do with each! Most people know where to find you on the web (with a little help from Google sometimes), right? We have embed-able sign-up form codes that contain a little snippit of HTML that you can quickly copy and paste right on your site, no computer science degree required! That way people can get connected to your Flocknote page without ever having to leave your website. 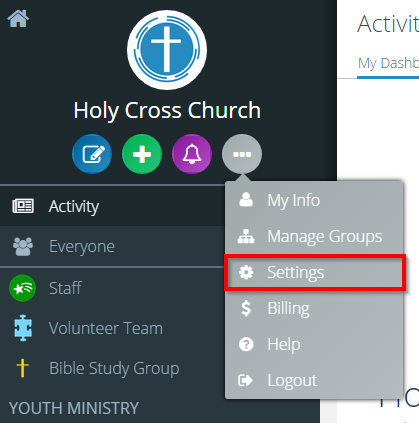 Group Settings (the screenshot below shows your Settings for your church as a whole). Do you have a current contact list for your ministry that includes names, emails and cell phone numbers? We’re pooling all of these together in Flocknote so that we have our members most up-to-date contact info. Your help with this ensures that your own info stays current and that we can reach more of our sheep as a church, so thanks in advance! 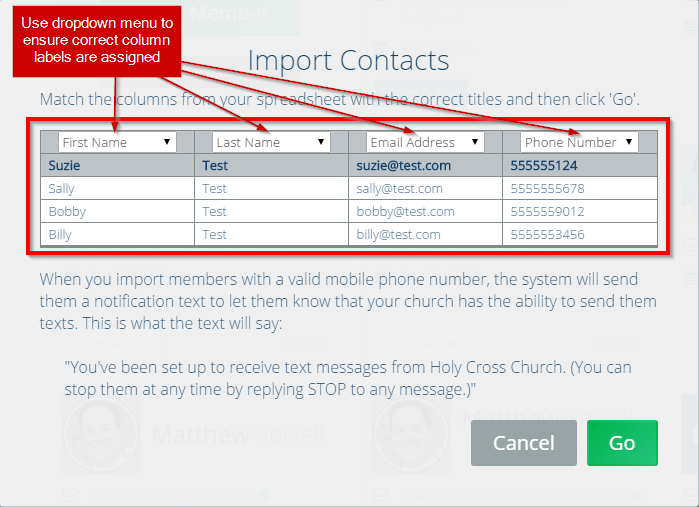 As an admin for your ministry in flocknote, you can add your members in individually, or if you drop them in a spreadsheet, you can import them all at once. You can find steps for both of those here. Alternatively, you can email your contact list to the folks at flocknote (help@flocknote.com) and let them know the name of your group and they’ll add them in for us. To import your members to Flocknote, you’ll want to have a spreadsheet that contains their names, email address, and phone numbers. It can either be an excel spreadsheet (.xls or .xlsx) or a .csv file. If you have separate spreadsheets for email addresses and phone numbers, you will want to combine the contact information into one spreadsheet – that way, each member will just have one account in Flocknote that contains both their email address and cell phone number. Make sure each column only contains one type of information. Basically, just make sure the email column only contains emails, the phone column only contains phones, etc. Make sure you only have one line of information per person – in other words, you do not want a person to have their email address on one line and, farther down in the spreadsheet, have a phone number. The contacts will import to your Group and you are all set! If you can, it’s best to upload your contacts by Group, instead of uploading them to the everyone list and then moving them around, it’s quicker to upload them to a specific Group. Similarly, if you import a contact to a Group that is already on file with another Group, the system won’t duplicate them, it will just pull up their existing record. Report or perform an Export of the Names, Emails, and phone numbers that are on file. Most programs can export directly to a CSV, but some may have the option to export out to an Excel worksheet as well. The help/support page for the particular type of software you are using might be able to point you in the right direction for exporting your spreadsheet of contacts. Select File | Import and Export… from the menu. Make sure Export to a file is highlighted. Now make sure Comma Separated Values (Windows) is selected. On the Select Folder to Export from popup, highlight the Contacts folder. Use the Browse… button to specify a location and file name for the exported contacts. Something like OutlookContacts.csv on your Desktop should work fine. Add this graphic to social media, in your bulletin, and wherever else you think people might see it. You can right click on the image and select ‘Download Image’ to save it to your computer. blue email or text icon button from the top left-hand corner underneath your church or organization’s name when you are logged in. If you don’t see these options, it means you do not have permission to send out new Notes to Groups. To post new Notes to a Group you must either be an admin over at least one Group. Putting it together: Your church or organization has Groups. Groups have Members who are subscribed to them. Notes are posted to Groups and sent out to Members in the Group according to their Notification Settings. One of the best parts about Flocknote is that your members can register themselves for your network. Using a vanity URL or a Text-to-Join keyword, your members can join your network, pick the groups they want to hear from, and be on their way (all without needing to create a password)! Your church or organization’s “Vanity URL” is a unique link specific to your church or organization through which people can join your Flocknote page. 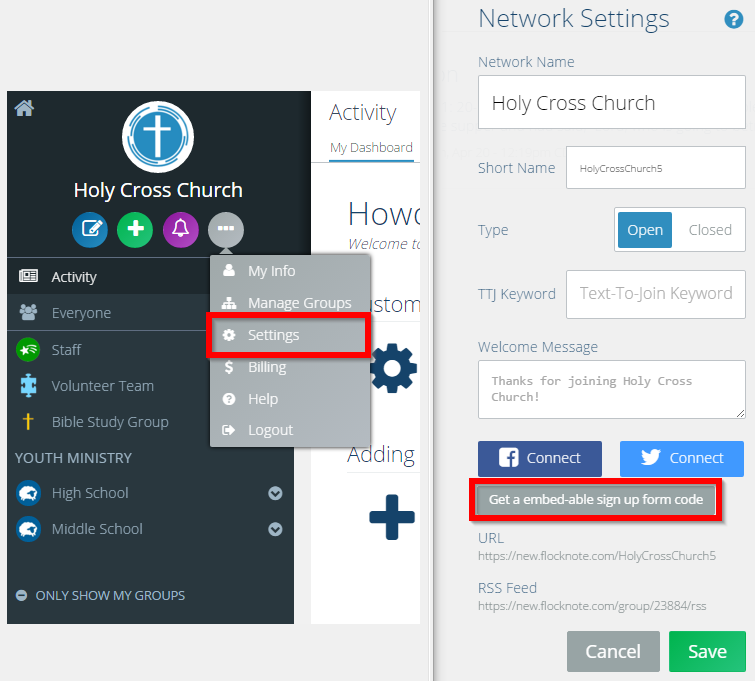 It’s set automatically when your network is created, but you can change it at any time (scroll down for where to find and change your church’s URL). 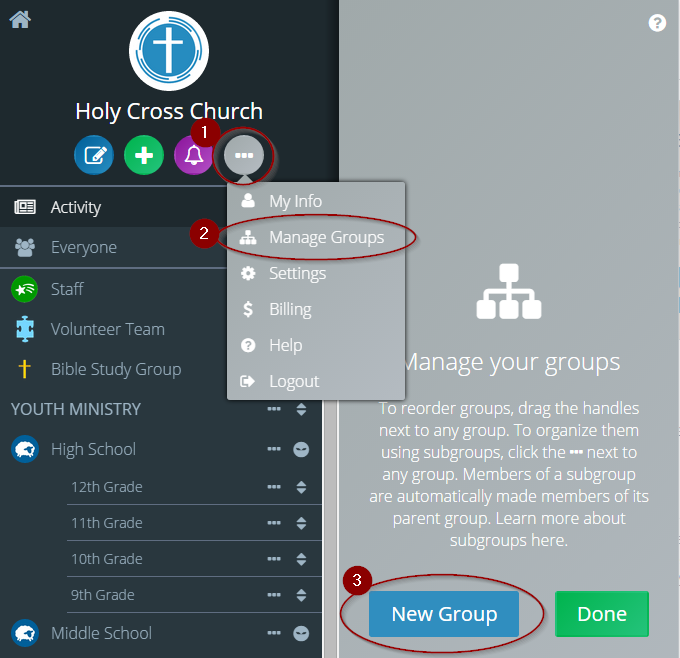 You can also set up text-to-join keywords for specific groups within your church or organization (see below for more information on setting up text-to-join for specific groups). More Menu (only Super Admins will see this option in their More Menu). To create a keyword for the first time, simply click in the white box next to “TTJ Keyword” and begin typing. When finished, click “Save”. If you’re editing or changing a keyword, simply highlight the current keyword in the same white box, type in your new keyword, then click “Save”. NOTE: If you receive an error message saying “Oops! This keyword is already taken.” it means that keyword is in use by another church or organization and you’d need to choose a different keyword. Text-to-join keywords are limited to 16 characters, are not case-sensitive, can only contain letters and numbers, and must have no spaces or punctuation. Each church or organization on Flocknote is given one TTJ keyword for free. Each additional TTJ keyword is $4/month. I’m getting our church/ministry set up on Flocknote – which is an easy way for us to text message and email our members. I’ve created a group just for your ministry and set you as an admin. You can setup a login by visiting [your vanity URL here – need help finding this?]. We’re pretty excited about this new tool. You can watch this video for a better understanding of how it will help us reach more of our sheep and a brief overview of how it works. You can also check out their training video here, and some common FAQs – like how is Flocknote different than using my normal email or phone? Here. Manage Groups. Then, click the blue New Group button within the gray ‘Manage your groups’ pane that pops out. this help article that discusses each field of the settings in detail. Please Note: Only Super Admins can add groups. If you are not a Super Admin, you will not see the ‘New Group’ button. You’ll need to contact someone who is a Super Admin and they will be able to set the Group up for you and set you as Group Admin. Making someone an admin in Flocknote only takes a few clicks. First it’s important to understand there are 3 different levels of admin privileges within Flocknote. Super Admin, Group Admin, and Note Senders. Super Admins: Can send notes to and manage all groups, add new groups, add and view members of all groups, and manage the network settings. Group Admins: Can send notes to and manage only the group(s) they are a Group Admin of, view and add members to groups they are an admin of, and manage settings for the groups they are an admin of. They cannot add new groups. Note Senders: Can send notes to only the group(s) they are a Note Sender of. They cannot view any member contact information for any group, nor can they add members to any group. If you want someone to be an admin over multiple groups, you’ll need to repeat this process for each group.